Low priced stocks with good growth prospects aren't easy to find, but they do exist. One of the most common mistakes that new investors make is to only buy stocks that trade for low dollar amounts. After all, it is natural to think that a stock trading for over $100 per share is "expensive" while another trading for under $10 is "cheap." But investing doesn't work like that, a lesson I learned the hard way. Nowadays you'll find far more stocks in my portfolio trading for over $100 per share than under $10. However, that doesn't mean that all stocks that trade for low dollar amounts need to be avoided. In fact, here's a list of three promising stocks that trade for less than a ten-spot that I think could outperform the market from here. Clinical-stage biotechs offer massive upside if everything goes according to plan, but they also face long odds against success. That's why it makes sense to buy a basket of these stocks so you can spread your risk. One company I like is Arrowhead Pharmaceuticals (NASDAQ:ARWR). Its lead compound is called ARC-520, which holds promise to be a functional cure for Hepatitis B (HBV). Early stage clinical studies showed that using ARC-520 with Bristol-Myers Squibb's Baraclude led to 99.99% reductions in serum HBV DNA levels. It that data holds up in late-stage trials, Arrowhead could be sitting on a gold mine. About 400 million people worldwide have HBV, a disease that can lead to cirrhosis of the liver or even cancer. If a cure became available, it would likely see mass adoption, which is why some estimates call for peak annual sales of ARC-520 to exceed $4.5 billion. We won't know if ARC-520 is the real deal for a few more years, and it is possible that, despite the stellar early results, later and larger trials might show that it doesn't produce a cure. Still, Arrowhead's upside potential makes it a company that might be worth nibbling on today as we wait for new data to become available. Consumer demand for data seems insatiable, so network providers have been in a never-ending race to add capacity to keep up. 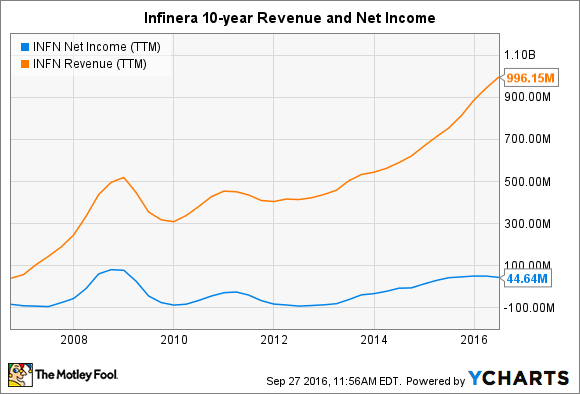 That fact has greatly benefited optical equipment manufacturers like Infinera (NASDAQ:INFN). The company's products have been gobbling up market share in the rapidly growing space for years, which has allowed its revenue and profits to soar. The company's stock was following suit, but shares crashed after Infinera shocked investors by forecasting difficult times ahead. Management is currently projecting that revenue is going to decline by 20% in the upcoming quarter. That's an enormous reversal from what shareholders are used to seeing. Infinera has given a range of rationales for the downbeat guidance, including a belief that customers are holding back on their spending until Infinera's next-generation system is available. If that's true, then the company will struggle to grow until the new system arrives. I'm willing to give Infinera the benefit of the doubt since it has a long history of introducing products that leapfrog the competition. That makes me feel good about its chances of returning to growth mode. For that reason, buying today while market pessimism is high could prove to be a profitable move. Each day, roughly 10,000 baby boomers turn 65, a trend that's expected to persist for the next 13 years. That tells me the demand for prescription drugs will continue to surge, and one smart way to play that trend is Teligent (NASDAQ:TLGT). Teligent is a specialty generic drug manufacturer with expertise in the topical, injectable, complex, and ophthalmic markets. Each year, a number of drugs in these categories lose patent protection, and Teligent swoops in to create copycat versions, win FDA approval, and then sell them at steep discounts. This business model is working out beautifully for shareholders. Sales grew by a huge 93% last quarter, and the company even managed to eke out a small profit. Teligent's backlog also continues to grow; it currently has 33 products awaiting FDA review. In total, the company believes that these drugs represent an addressable market opportunity of $1.6 billion. That sets the stage for continued fast growth. Looking ahead, analysts are calling for nearly 40% revenue growth next year and for the company's profits to triple. With the wind at its back, I think Teligent should be able to grow at above-average rates for years to come, so count me as a bull.